The Fed put in place “Operation Twist” on September 21, 2011 with the goal of guiding long rates to a lower level. The 10-year Treasury note yield closed at a low of 1.72% on the day after the new policy was instituted. As of this writing, it is trading at 2.33%. The 30-year mortgage rate dropped briefly to 3.94% but is back up at levels seen just prior to the announcement (4.10%). 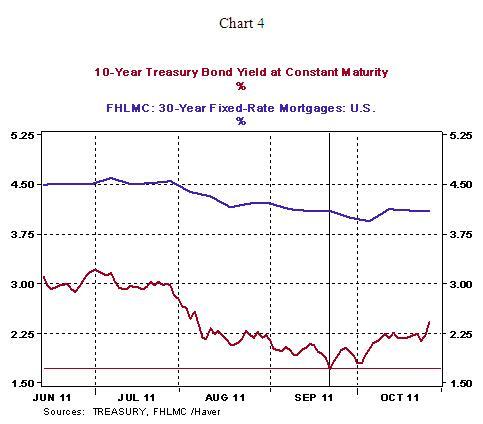 Effectively, the 10-year Treasury note yield has moved up and the 30-year mortgage rate is holding at a level seen before Operation Twist was announced (see Chart 4).